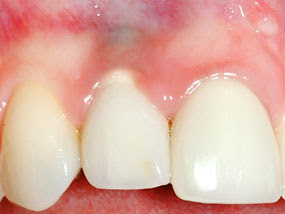 Recession can occur around dental implant restorations if an implant is placed too far towards the buccal. If the restoration is good and the emergence profile well contoured, Gingival Graft Microsurgery can change the gingival bio-type to restore normal tissue thickness and contour. The Titanium implant surface shows through the tissue and bone as a dark shadow. This occurs when the implant is placed buccally or an osseous dehiscience occurs. 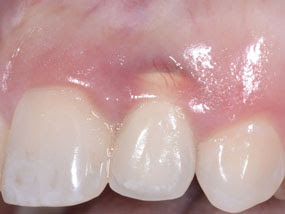 Gingival Graft Microsurgery can change the gingival bio-type increasing the tissue thickness to mask the metal shadow.